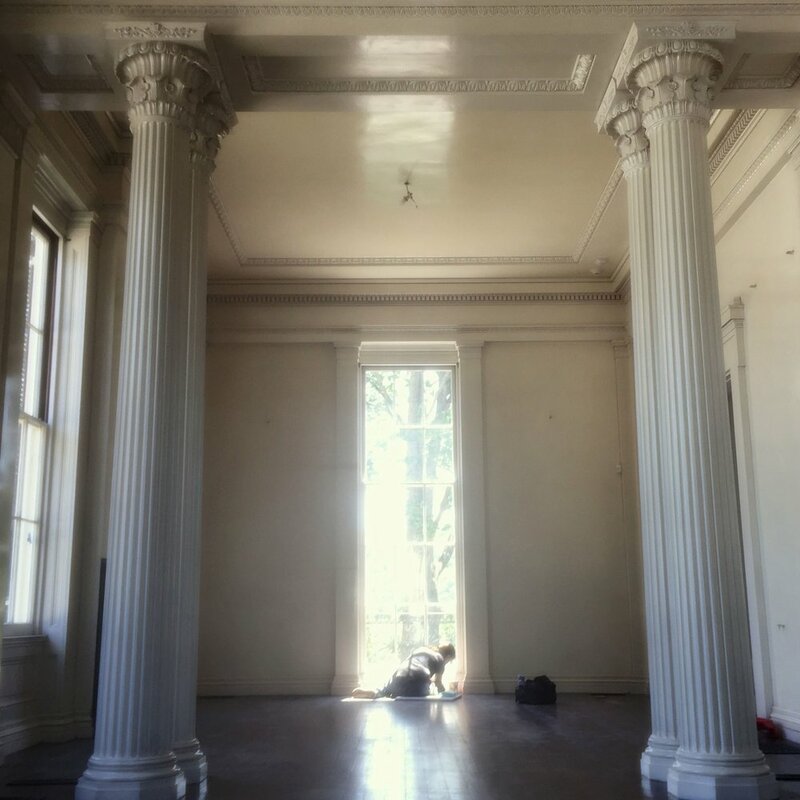 2017-Conservation of the original paint in the double parlor. The surfaces presented various types of damage while retaining the original paint. We corrected all of the defacing damage while retaining this original paint. 2011-Investigation of historic painted decoration, including a large exposed and conserved area of original ornamental paint scheme. 2011-Condition report on courthouse murals. Procedural recommendations and stabilization followed. The murals, a significant PWA project, cover the entirety of the courthouse interior and were executed under the direction of Eugene Savage. 2001-Paint investigation leading to the discovery of 12 over-painted murals c.1930. 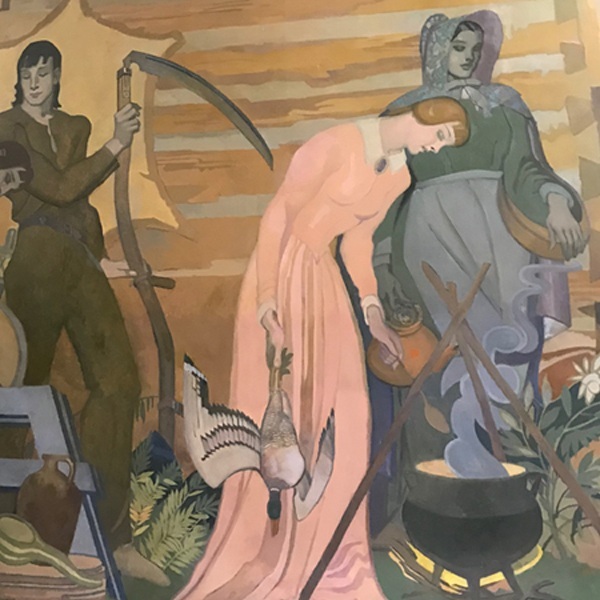 Conservation of the 12 murals and replication of 3 murals in the East courtroom of the Honorable Judge Sarah Evans Barker. 1995-Paint investigation resulted in both conservation and, where necessary, replication of historically significant painted decoration. 1998-Removal of paint from the fiber tiles composing the sanctuary walls. Repair of damaged tiles and wall. Repair of water damaged moldings, walls and ceiling in the chancel including the gilt half-dome. 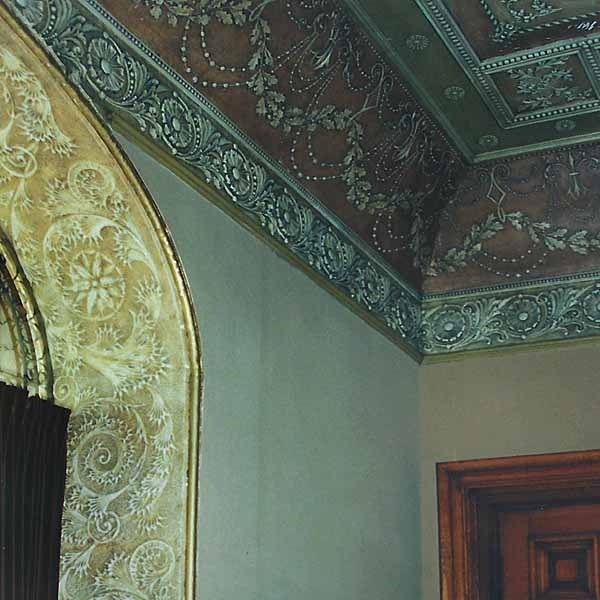 2003-Replication of missing Moorish style decoration in secondary hall. Included the manufacture of flocked wallpaper design to match existing historical wallpaper in main hall. Recreation of pastiglia frieze.